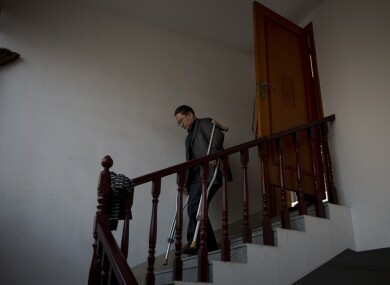 Chinese official Zhou Wangyan, head of the Liling city land resources bureau, who spoke in 2014 about abuse he suffered in the detention system. CHINA’S PARALLEL JUSTICE system for Communist Party members relies heavily on torture and is “abusive and illegal”, Human Rights Watch (HRW) said this week, calling for it to be abolished. The 88 million members of the country’s ruling party are subject to an internal justice system known as “shuanggui”, which operates without oversight from judicial authorities and has been increasingly criticised by China’s legal community. More than 15 officials have reportedly died from abuses in “shuanggui” since 2007. Since coming to power, President Xi Jinping has presided over a much-publicised drive against corruption that has punished more than one million officials in what some compare to a political purge. “President Xi has built his anti-corruption campaign on an abusive and illegal detention system,” said Sophie Richardson, HRW’s China director. A report released Tuesday, based on analysis of court verdicts, media reports and interviews with former detainees and their family members, details the abuses of the system. Typically, “shuanggui” subjects disappear without warning and are held in unofficial detention facilities until they “confess” to corruption. Then they are brought into the criminal justice system and convicted. Tactics used to extract confessions include prolonged sleep deprivation, food and water deprivation, severe beatings, being forced into stress positions for extended periods of time and threats to family members, among others. One Beijing-based lawyer described the case of a client who was given only an hour of sleep a day and was forced to spend the rest of his time balancing a book on his head. After eight days, he “confessed to everything and to whatever they said”, the lawyer explained. Chinese courts have a conviction rate of 99.92 percent. “The courts function as rubber stamps, lending credibility to an utterly illegal Communist Party process,” said Richardson. In October a key meeting of the Communist Party called for stricter control over its members, promising to strengthen internal curbs on their behaviour. Newly issued rules after the conclave further tighten ideological controls that have already increased dramatically under Xi. They call on party members to oppose acts contrary to the party leadership and promise increased investigations into behaviour that does not follow the party line. Email “'My buttocks were raw and oozing pus': Abuse at China's unofficial detention centres”. Feedback on “'My buttocks were raw and oozing pus': Abuse at China's unofficial detention centres”.